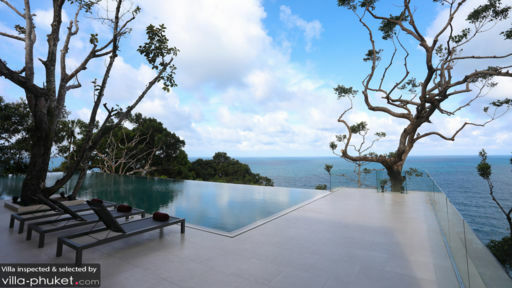 Right on the cliff’s edge with expansive and sweeping views across the ocean on Kamala beach, Phuket, stands the majestic Villa Amarisa with its luxurious interiors, unique style, and comfortable living. The villa is the epitome of opulence and its art deco style featuring private art galleries in corridors and bedrooms is nothing short of eclectic. As the infinity swimming pool offers the most spectacular views, the five bedrooms have their own tryst with nature through glass doors and windows. 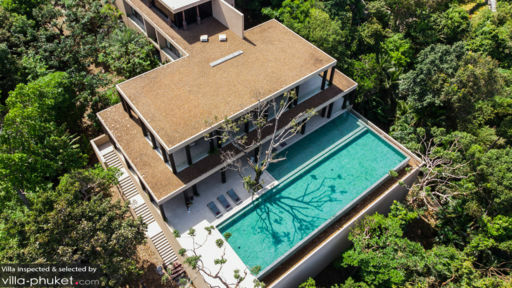 The villa is a combination of traditional Thai architecture and contemporary living with plenty of room for everyone to have an immensely good time. Each of the five bedrooms at Villa Amarisa are one of a kind and you will see no repetition in their styles and decors. Two of the most extravagant bedrooms are furnished with king-sized beds and feature cosy additional seating, opulent and rich interiors with jewel-toned wall tapestries and weaves, as well as artwork lining the walls. One bedroom has two, four-poster queen-sized beds with an intricate wire frame, while another has three single beds on a raised wooden platform. The last bedroom is also furnished with one king-sized bed. All the bedrooms areair-conditioned and designed with care to deliver the best experience. They have en-suite bathrooms with many necessary amenities as well as other services for your use. The Olympic-sized swimming pool extends out to meet the azure waters of the ocean and the surrounding luscious flora is just the cherry on top. 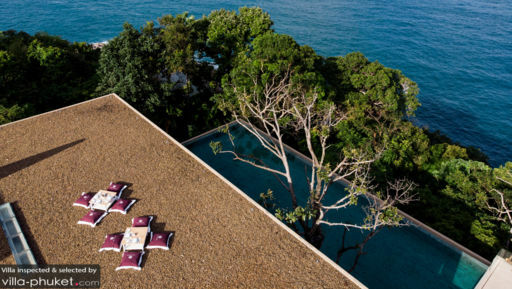 For the most spellbinding views, relax on the poolside terrace where you have several comfortable daybeds all placed facing the panorama under a Thai, wooden ceiling. You will even find an alfresco dining area on the same terrace for an intimate feast with loved ones. Decorated with rare finds from across Asia, the terrace is just the beginning to what is one of the best villas in town. Enclosed within glass walls that look outwards to the scenic beauty of the area, the living area is located poolside and is a more formal and modern space with hints of tradition as observed in its rustic, hand-crafted furniture. Furnished comfortably with plush sofas, wingback chairs, antique coffee tables, and a settee, the living space is the ultimate place for relaxation after a long and tiring day. The wooden floors are adorned with locally-woven carpets while a work desk that can double as an easel if you’re a painter stands close by. Check out some of the coffee table books or grab a drink from the indoor bar which is fully-stocked while the sun sets and the lights turn on. This interspersing of the old and new gives Villa Amarisa its unique quality. There are passages and corridors turned into art galleries where you can spend hours if intrigued. Selective pieces have been put on display for your eyes only to make for a gorgeous and wholesome space. The formal dining is also found indoors with a 12-seater dining table for guests. A fully-equipped stainless-steel kitchen is also accessible however, it is always better to hire a private chef to do the cooking. Villa Amarisa is a fully-staffed property with services such as housekeeping, maintenance, personal guest assistance to care for individual needs, and security looked after. There are certain amenities that are available upon request such as laundry, massages, car or boat rentals, airport transfers, and private chef. Kamala beach is an exciting part of Phuket with vast stretches of sandy shores where you can enjoy a refreshing dip in the oceanand relax on your beach towels. The area is teeming with restaurants, beach bars, and spas. Some of which include Old Siam, White Box, and Silkto name a few.